For the 4th month in continuance, Reliance Jio has been declared as India’s fastest 4G service provider with speed of 19.12 Mbps, pan-India. This way, they have comfortably beaten Idea, Vodafone and Airtel in the race of speed. Surprisingly, Airtel has achieved an average 4G speed of 10.15 Mbps, which makes them #4 in the ranking. In the month of February, Airtel was ranked #2. Last month too, Jio was #1 player for 4G download speed with the average speed of 18.48 Mbps. On the other hand Idea and Vodafone has improved their performance remarkably in the last month. With 13.7 Mbps speed of 4G network, Idea is now India’s 2nd fastest network after Jio, and with 13.3 Mbps download speed, Vodafone is at #3. These data and ranking of 4G download speed for the month of April have been reported by TRAI, based on their MySpeed app, which tracks and reports all forms of mobile Internet speeds, across India. 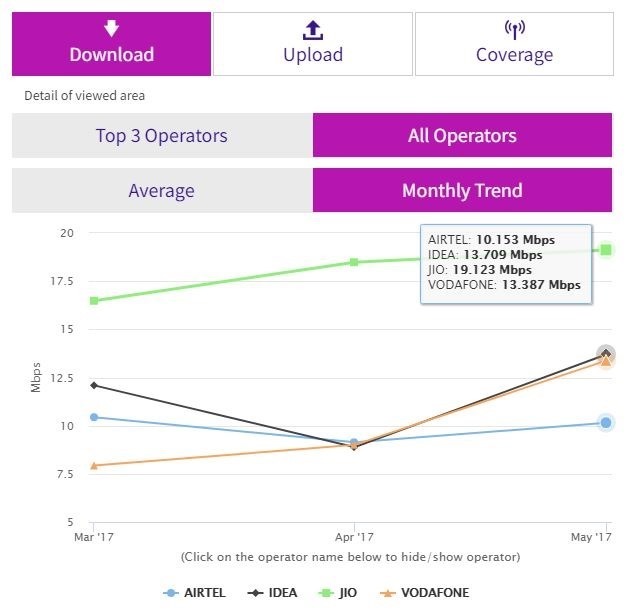 If we talk about 3G download speeds, then Vodafone has emerged as the #1 player with an average speed of 5.9 Mbps for the month of April, followed by Airtel with speed of 3.9 Mbps and Idea at #3 with speed of 3.75 Mbps. This stellar performance by Jio is noteworthy, considering that they have comfortably beaten all telecom players in generating revenues as well. In a report published last week, it was reported by Kleiner Perkins Caufield & Byers that Jio’s Average Revenue Per User or ARPU is right now highest in the country. As per the report published, ARPU of Jio’s customers is $4.70, which is Rs 300. Compared to this the average ARPU of Airtel, Idea and Vodafone combined was found to be between $2.8 and $3, which is Rs 195. Hence, at this moment, especially after Jio’s Prime rollout, an average telecom subscriber is paying more money to Reliance Jio, compared to any other telecom player. Another interesting find from the report: Out of 108 million free users, Jio was able to convert 67% or 72 million into their paid customers. Hence, theoretically, Jio is earning close to $338 million from the paid subscribers. As per TRAI’s May, 2017 report, Jio has right now captured 9% of the Indian telecom market. Airtel is still #1 with 23.39% share, followed by Vodafone at 17.87% and Idea at 16.70%. "Jio Beats Airtel With 19.12 Mbps Average 4G Speed; Vodafone #1 in 3G Speeds", 2 out of 5 based on 3 ratings. Now, Paytm Enables Traffic Challan Payments; Service Live in Mumbai, Pune & Vijayawada! BSNL committed to give 4Mbps as minimum broadband speed, not mobile broadband. Please check and write. And coming to these speed test results of TRAI’s APP, the more number of speed tests happened for a operator at it’s best places, then that particular operator will definitely have edge.